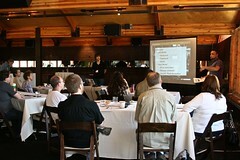 Digital Publishing for Authors Workshop was a hit! On Saturday, Jeff Moriarty and I talked for 8 hours. No, you're not surprised. But this time, it wasn't just to see which one of us got tired first. That day marked the first of many workshops, classes and educational experience for a brand new company we started, ePublish Unum. The intent? To educate independent authors about the world of digital publishing. And by all accounts -- half the post-class surveys are in -- it was a smashing success. If you were one of our attendees, much thanks for coming out. We really enjoyed presenting to you. I'm not going to wax poetically on the event here. I'm going to let Ruth and Dan do that, as they both have great posts on what the class meant to them. And no, we didn't ask them to say nice things about us, either! If you missed it, fear not. We have many more planned. Yes, more full-day workshops like this one. Even some multi-day conferences. And a slew of smaller, much more highly targeted opportunities as well. And that's just the in-person stuff! We're scheming on a virtual options for those of you who don't live in the greater Phoenix area. Stay tuned for more. Finally, a huge THANK YOU goes out to my lovely wife, Sheila Dee, and Jeff's lovely wife, Dannie Moriarty. Not only are they tireless (oh, but I can only be they get tired) supporters of the two of us, but they also quite literally built the workbook we used during the class. And it got rave reviews! Thank you, ladies. We could not have done this with out you.